It is the highest mountain in Africa, standing 5895 m high. The first successful attempt to climb the mountain was made in 1889 by two Austrian mountaineers. They discovered that one of the ranges, Kibo, has a crater and they studied it as well. The reason Kilimanjaro is the subject of various scientific studies is because it is an unusual case. It is actually a strato-volcano, which has been formed due to continuous lava flow. Out of its three volcanic cones, two of them are extinct. The third one is also no longer active and is the highest point of the mountain. This is known as the Kibo range and there are chances it could erupt again. Apart from the six different climatic zones, the mountain also boosts six separate ecological zones, which have cultivated land at the bottom, rainforest, heath, desert, moorland and then the Arctic Summit at the top. It is unusual to have a snowcapped mountain in this region. It takes about 5 to 6 days for an average climber to cover the summit. Previously, it used to take much longer. Many climbers turn back each year due to altitude related problems on the summit. Almost 10 people die every year during their climbing journeys out of nearly 25,000 people who attempt to climb the summit each year. Coffee is grown on the lower side of the mountain. Ernest Hemingway developed a short story called ‘The Snow of Kilimanjaro’ based on the mountain. A South African man has scaled the Kilimanjaro twice and that too on his wheelchair. It took him only 6 days to cover the mountain on his second attempt in 2007. The oldest person to have climbed the mountain was an 87-year-old man while the youngest was only 7 years old. The ice caps on the top are the main source of water that trickles down the mountain. There is approx 400 tons of water. However, the ice caps are diminishing and eventually a water shortage can occur. To protect the water sources, more trees need to be planted around the mountain. The ice caps have lost almost 80% of their mass and if global warming continues at this rate, they may be completely gone by 2020. Are you inspired by these facts and now want to take a visit on your own? You can head out on a trekking trip even if you are not a climber. Just book a travel guide and go visit this beautiful mountain for yourself, and while you are in Tanzania, might as well head out on a safari as well. 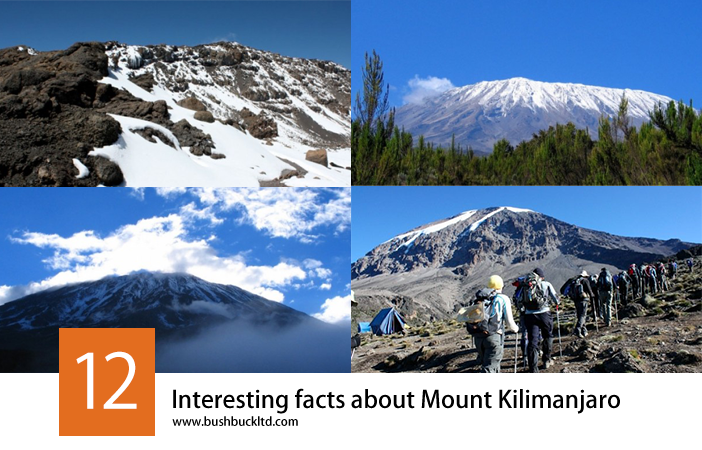 These facts have been compiled by Bushbuck Safaris who are the pioneers of mountain climbing treks in Tanzania offering guided climbs of Mount Kilimanjaro and Mount Meru all year round. Contact Bushbuck Safaris to book your climb now or view more information, itineraries and climbing routes for Mount Kilimanjaro.